Finding the perfect gift for someone is always exciting, especially when happy memories are involved. In 1988 I purchased a beautifully illustrated Sushi cookbook for my father’s Christmas gift. Over the years one of the highlights of our shared culinary adventures had been watching the extremely talented chef’s at a local restaurant, the Mikado, make elaborate exquisite sushi platters. When we went to exchange gifts that year, I noticed a remarkable similarity in the size of the wrapped gifts. I was thrilled to find that he had bought me the same book as a present. In 1992 I had been making jewelry using slices of mokume gane made from tinted translucent polymer clay and aluminum leaf. After seeing a large trolley of iced fish and noticing the glistening reflections off of the scales…it reminded me of this mokume gane. 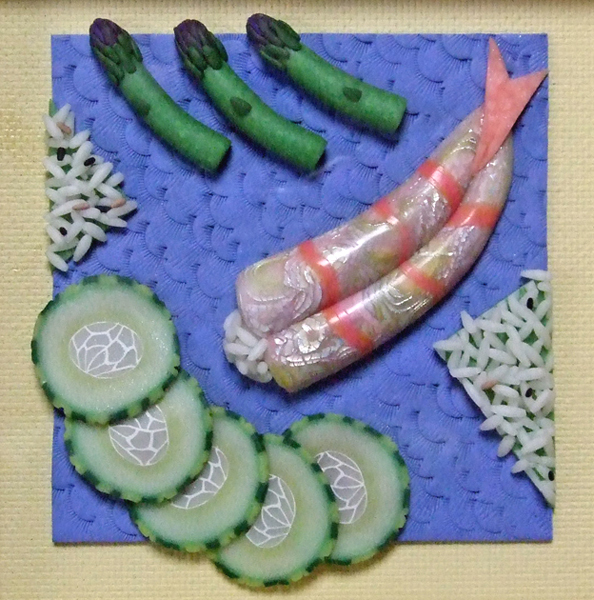 Using the sushi cookbook as a reference, along with several trips to the local Japanese restaurant, I set out to make a sushi platter out of polymer clay. Initially I planned this as weekend project at an artist’s retreat. 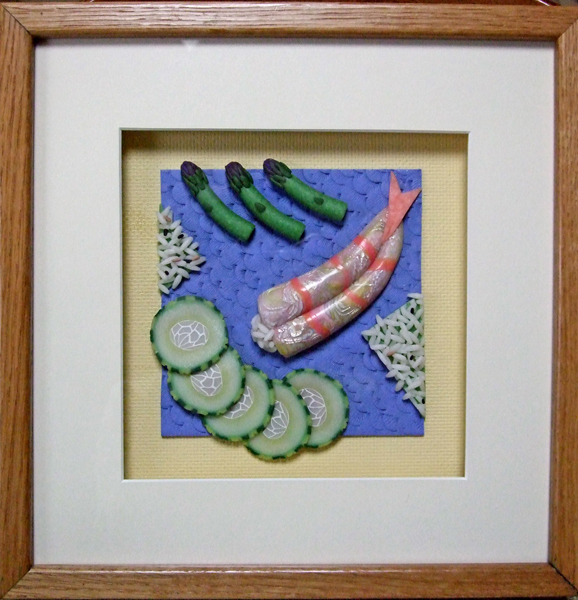 By 4:00 am Saturday night, after having hand rolled hundreds of pieces of “rice” from translucent polymer clay- I expanded my time frame to include several weeks. I enjoyed making the avocado cane, mixing the wasabi colored clay and fashioning the ginger with a dusting of metallic mica powder. The base of the platter was made from slices of a white and translucent cane applied to a base to mimic the translucency of Japanese porcelain. 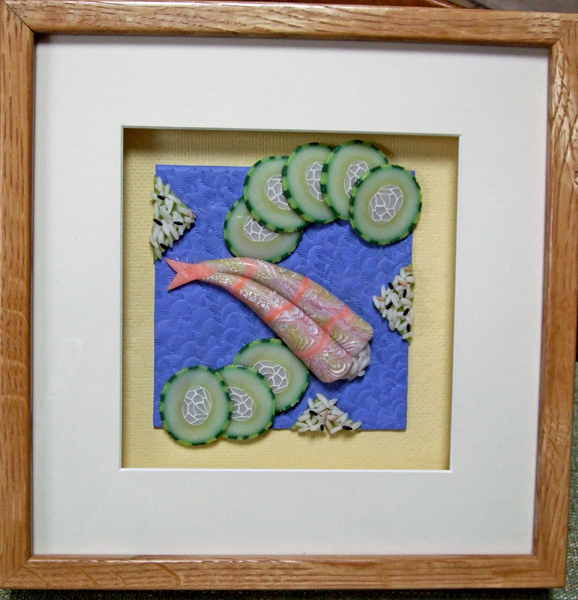 Soon after I finished this piece, my Dad borrowed it and showed it to the sushi chefs at the Mikado. 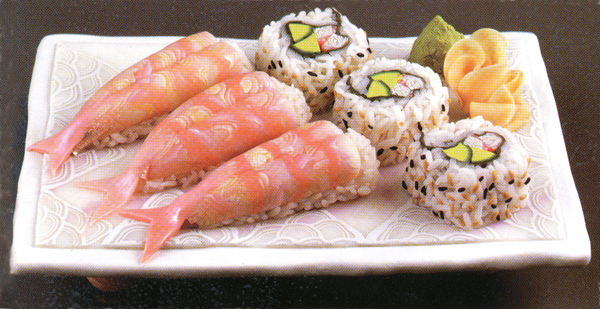 The implicit humor, of exaggerating the details often used in the sample plastic food in the windows of Tokyo restaurants didn’t escape them. Their reaction helped propel me to further explore fantasy/plastic food. 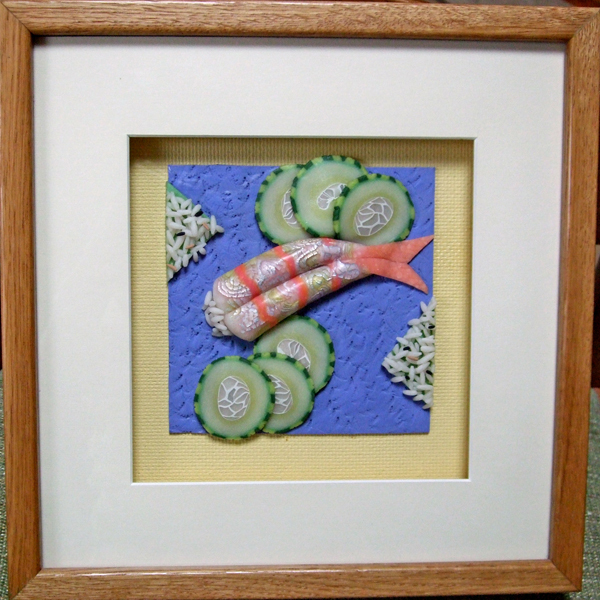 Making rice small enough in scale to work on a piece of jewelry was outside the scale of my patience, so I decided to make a series of three “larger” wall pieces designed to be displayed in 12 x 12” shadow boxes. I especially enjoyed making the cucumber cane and making the decorative peel to the outside of the cane using a fork and a vegetable peeler. The choice of cream yellow and blue violet as the background colors, while not typically Japanese, helped me to balance the compositions. Currently I have several food inspired wall pieces in the works, including chocolate, coffee beans and citrus slices.